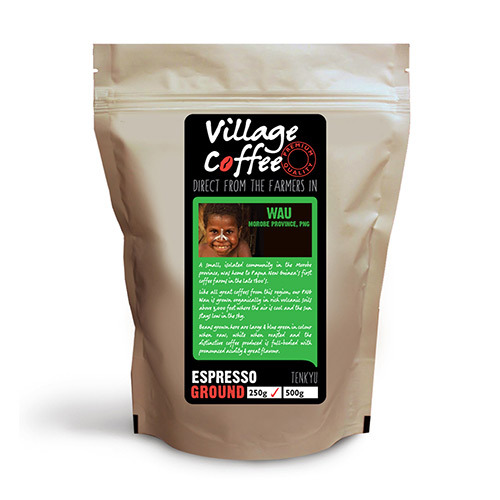 Village Coffee is Papua New Guinea (PNG)’s smallholder premium organic grade coffee. Coffee is graded on a scale covering bean size, defect count, colour, odour, roast aspects and cup quality; AA, A, AB, B, C, PB, X, E, PSC, Y1, Y2 and T.
We sell 100% organic arabica beans from smallholder growers in the PNG highlands. Consistency and quality is ensured by personal attention to the supply chain from grower to roasting and packaging. Village coffee works with the Coffee Industries Corporation (CIC) in PNG to ensure a transparent, fully documented and thorough process for sourcing the coffee we sell. Wau is the first coffee growing area Village Coffee is sourcing it’s coffee from (July 2013). Other villages (areas) will follow soon. 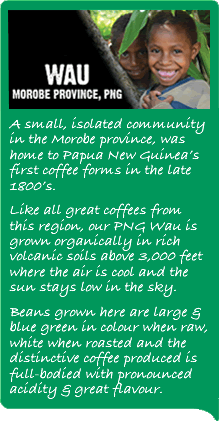 A small isolated community in the Morobe Province, was home to Papua New Guinea’s first coffee farms in the 1800’s. Like all great coffees from this region, our PNG Wau is grown organically in rich volcanic soils above 300 feetwhere the air is cool and the sun stays low in the sky. Beans grown here are large and blue/green in colour when raw, white when roasted and the distinctive coffee produced is full-bodied with pronounced acidity and great flavour.